The Trojan horse is famous. The horses of Meridian would be famous as well. Made in 1890s, The Dentzel Carousel, a national landmark in Meridian, is already famous, and it is not just for exhibition but for actual riding for the young and the young at heart. 'The Around Town Carousels Abound' project offered many companies and organizations fiberglass carousel horses measure approximately 5' x 4' 11" for $2,500 per piece. It is a public art project. Popular local painters and art groups painted the horses and put them in front of the sponsors' buildings. They make the city very beautiful. The project is still going on, and the number of horses is growing. You can enjpy all the horses at the site below. 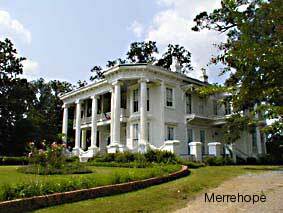 Meridian is located in east central Mississippi very close to the west border of Alabama. There is a major transportation junction here: I-20 and I-59 along with U.S. Highway 45. The newly built Amtrak station has a unique look. It serves twice a day to and from New Orleans and New York. The line is called "The Crescent" taken from the nickname of New Orleans. The nickname of Meridian is "Queen City" because it was the second largest city next to Jackson, Mississippi's capital("King"). Nowadays, Biloxi is the second and Meridian dropped to the third. The population is about 40,000 and the ratio of white, black and the others is 44:54:2. Why did Meridian decrease in population? Some say it's because of the selfishness of business people in Meridian. Meridian's founding fathers didn't like to have outside businessmen to come in because pay competition was supposed to be inevitable. So, no competition and no payraise. It was like an isolationism. "This was the cause of falling," some people told me. 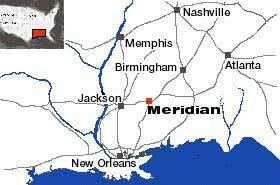 Meridian is in the 'Pine Belt' and is a distributing center of timber. 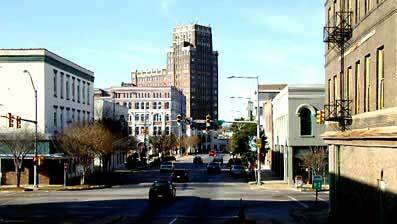 Also, Meridian is a commercial and industrial center for east Mississippi and west Alabama. Meridian is also a good place for retirement life. The average buying price for a house is $79,912. It is a lot cheaper than Hattiesburg's $94,000. In addition, there are three huge general hospitals and the total number of beds is over 1,150. Hattiesburg has only 750 beds. It is my opinion that Meridianites are very religious. The number of churches is over 200 into 40,000. That means there is one church for every 200 people (one church for every 146 people over 18-year-old). As you well know, Meridian is in the "Bible Belt," too. You might feel very odd when you hear that there is a Navy Base in Meridian, which is located far from the sea. Actually it is a Naval Air Station, and its main feature is training pilots both from the states and the friendly countries overseas. There is also a good golf course at the Base. Anyone can play there even people not affiliated with military. You need only to show your driver's licence and insurance card to enter the gate. The most famous Meridianite is Jimmie Rodgers (right); "the Father of Country Music" (1898-1933). He once was a "singing brakeman" who worked for Amtrak. Though he was unable to read or write music, he made many million-seller songs. He is most widely known as "America's Blue Yodeler." There is Jimmie Rodgers Museum in Highland Park. We have an annual Jimmie Rodgers Memorial Festival in May. You can listen to country music and gospel music. Sela Ward (left), a movie and TV actress, also is from Meridian. World famous Peavey, a musical equipment company, has its headquarter and factories in Meridian. Manufactured around 1895. In operation since 1909. 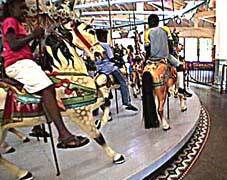 This is the world's only two-row stationary Dentzel Menagerie Carousel. The museum displays the original guitar of "The Singing Brakeman" and other memorabilia of his life and career. James Chaney was a slain Civil Rights worker who was active in the Freedom Summer Movement of 1964. Followings are my personal preferences. near Walmart at HW19 N.
Address: 421 Willow Ridge Drive #26, Meridian, MS 39301, U.S.A.